Kleefeld on Comics: Justifying Illegal Scanlations? My browser of choice is Google's Chrome. Without going into an extended explanation, I'll just say that it works better for me than anything else I've looked at. Like some other browsers, though, there are extensions available for it. Little add-ons that can improve/change the functionality of the browser. I've got one that, when turned on, will display the style sheet characteristics assigned to any element on a web page. I've got another that rounds the corners on the images in Facebook and, oh, hey, it also eliminates all the ads that run down the right side. I was browsing the extensions that are available and stumbled across one called "All Mangas Reader." Naturally, my curiosity was piqued. 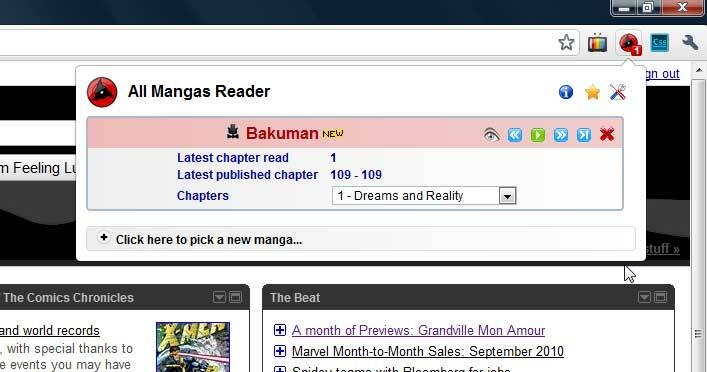 If you are a manga reader, this extension is made for you, it helps you reading mangas on your favorite web site by displaying full chapter scans instead of single pages and warns you when a new chapter of your favorite manga has been published. If you are not a manga reader, i hope this extension will help you to become one ! I can go directly to either the last chapter I read or the latest chapter, using those numbers; the drop-down presents all of the chapters; the forward/reverse buttons go to the next/previous chapters. The pages just pop open in your browser window. From a usability standpoint, this thing seems pretty well done. And, while I haven't played with it, there are some notes about being able to sync up your reading among several computers, so your reading isn't interrupted between work and home and your laptop and wherever. It seems pretty cool, and well-executed. Plus it's a free extension for a free browser, so what's not to like? Well, there is that minor issue of the pages that come up being illegal. All the extension does, really, is just direct users to existing scanlation sites. It does an excellent job of it, but the material it's pointing to has been scanned from published manga, translated by a fan, and posted online for free. Without the publisher's permission. This is what said publisher's have started cracking down on the past year. But the browser extension? It's downloadable from one of Google's servers. You know, Google? They just posted 3rd quarter (that's just three months) revenues of $7.29 billion. They are a big player and generally have a good reputation for staying on the right side of the law. I'm not about to argue that they're liable for the content that somebody using one of their platforms links to. But if you didn't know any better -- and a LOT of people aren't very 'net savvy -- I can easily see how you might think that the content being linked to through AMR was completely legit. I don't think many (most?) people recognize that most extensions aren't actually made BY Google. I think a lot of people would see the AMR extension as something Google specifically created for their browser, just to make it easier to link to all the wonderful free things that are online. Just like their search engine, only a little more specialized. Certainly, that won't be everybody. I'm not naive enough to think that a good number of people download the extension without knowing full well that the pages they subsequently look at are illegal. But I'm betting it's fooling some folks. Some folks who don't really put much thought into those types of things because, hey, this is America and we're not supposed to actually think for ourselves. I'm betting that a good chunk of those 30,000 or so users of AMR don't know exactly what they're looking at when they read manga online. I notice, too, that Pierre-Louis had previously created and posted a Chrome extension called "One Manga Reader" which, as near as I can tell, functioned largely the same way, but was more limited in which scanlation sites it referenced. That one no longer works but he seemed to have gotten enough support and encouragement to extend his initial effort much further. Indeed, the Help section of AMR has detailed instructions for how to get your favorite site included in his list. I've been noodling this for only a couple of days, and don't really have any answers yet. I'm still not even sure of most of the questions, honestly. But I figured I could at least point this out as a part of the broader scanlation discussion, and see if it sparks any other thoughts or ideas.